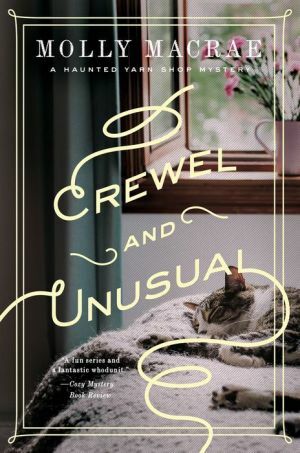 The latest mystery in this charming mystery series finds the ever-resourceful Kath Rutledge and shop ghost Geneva tangled up in an embroidery rivalry―and a murder. Yarn shop owner Kath Rutledge is looking forward to the grand opening of the Blue Plum Vault, a co-op of small shops on Main Street. But in the week before the grand opening, Kath and her needlework group, TGIF (Thank Goodness It’s Fiber), hear rumors of an unpleasant rivalry developing between two of the new shopkeepers. Nervie Bales and Belinda Moyer declare each other’s embroidery patterns and antique embroidered linens fakes, copies―and stolen goods. Kath is caught in the middle when she’s asked to use her textile expertise to decide if there’s any truth to the accusations. Then, the day before the grand opening, an exquisite tablecloth that Kath has fallen in love with―the pride of Belinda’s shop―is found cut to shreds. Belinda accuses Nervie of the outrage, but Nervie has an airtight alibi: she was at Kath’s shop, the Weaver’s Cat, teaching a crewel embroidery class. Despite worries over the rivalry and vandalism, the opening is a success―until Belinda is found dead, stabbed in the back with a pair of scissors from the Weaver’s Cat. Geneva, the ghost who haunts Kath’s store, claims she saw the murderer leaving the scene of the crime. But the ghost is the ultimate unreliable witness―only Kath and her shop manager can see or hear her. That means it’s up to Kath, TGIF, and especially Geneva the ghost to solve the crime before the killer cuts another life short.